At the annual Lighting Lunch in London in 2016 hosted by Mark Jonathan, Mark White from ETC gave a cheque for over £19,500 to Backup – The Technical Entertainment Charity. This ETC donation comes from people who have bought the European version of the ETC iRFR or aRFR remote control app for their phone or tablet over the past year, all of whom had the choice of whether their money went to the Charity. 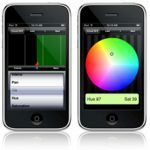 The apps which turn any Smartphone into a real time remote lighting controller can be downloaded from the iTunes store or Google Play Store. Backup – The Technical Entertainment Charity provide financial assistance to entertainment technology professionals, or their immediate families, who are seriously ill or injured. Grants may be used for basic living costs, retraining, funerals, some medical expenses and travel.